The muted colors in the backdrop add to the happiness of this photo. Well, I don\'t know this woman but her smile has inspired me to repeat one of my better quotes. 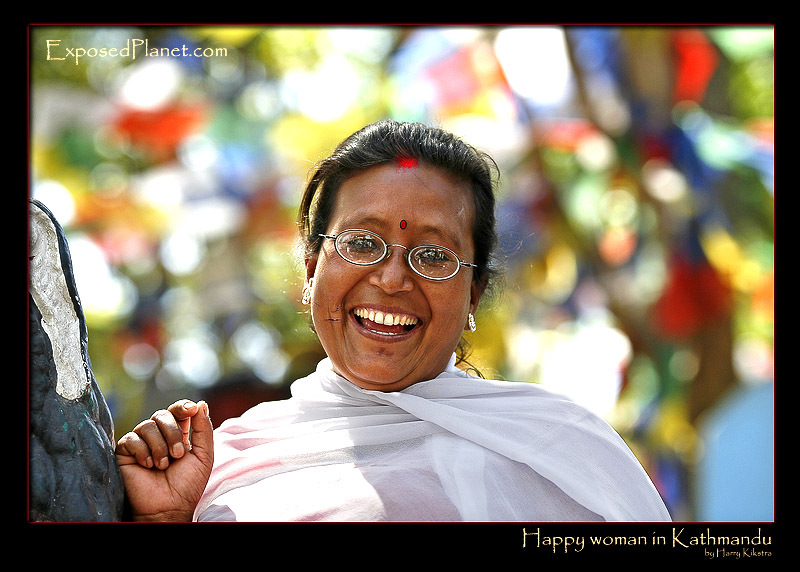 The story behind "Happy Woman in Kathmandu with prayer flags"
Even the Maoist strikes and the government curfews and all the resulting inconvenience could not break the good temper of the poor people from Kathmandu, Nepal. The Nepali were not allowed to go on the streets during the day, but they could stay at the holy places, so they just went there early morning and enjoyed the fresh breezes and views over the city all day. Nepali never seem to worry too much, they are quite pragmatic and see the good side of most bad things that happen to them. They just hang up a few more prayer flags, thousands of them can be seen out of focus in the back here. Sometimes people ask me to send them the photograph, as I always show them the result on my little screen of the digital camera. It is hard to explain that I normally do not make prints, and most people do not have a fixed street address anyway. But this woman was the first I asked that had an email address, so I want to send her this copy, but somehow the small scrap of paper with her address got lost during the trip. So if anybody knows this friendly woman, living close to the Swayambunath temple in Kathmandu, please show her this website and thank her for me!